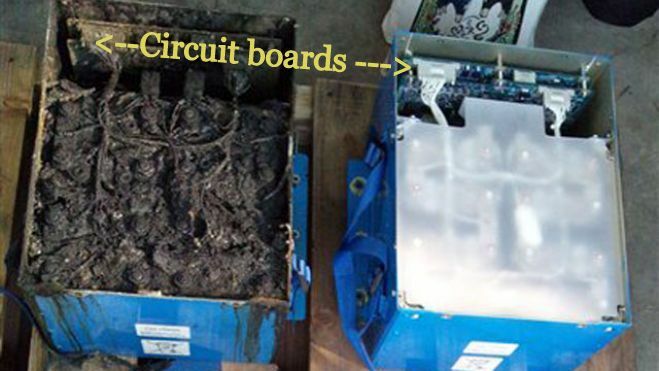 Japanese investigators are making a remarkable claim in the most recent update into the burning battery on an All Nippon Airways Dreamliner; the ship, JA804A was one of only three Boeing 787s to retain a wiring design the planemaker later revised. 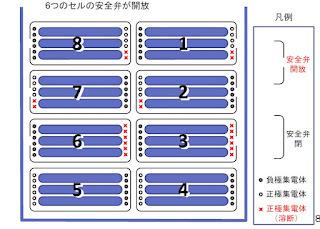 In the original design, both of the Dreamliner's lithium ion batteries were connected to each other, according to a review of the report, written in Japanese and released by the Japanese Transport Safety Bureau on Wednesday. Since I do not read Japanese, I rely on the rough translation of my man in Tokyo, Takeo Aizawa, and the very good illustrations and photographs in the report. 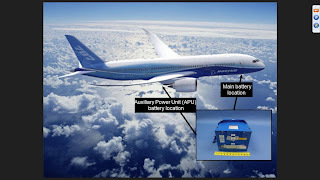 As I understand it, the APU battery, located aft of the 787 wings and the backup power supply battery located in the E&E bay were connected to each other according to the original circuit design of the airplane. 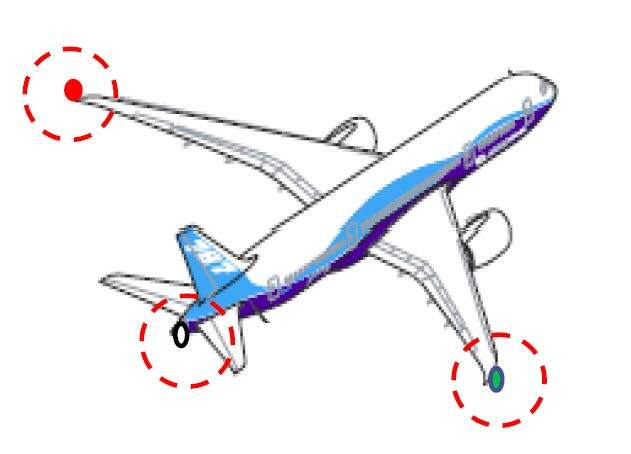 While Boeing later modified this design isolating the batteries from each other, this change was not made in JA804A or two others produced before the circuitry revision. When the airplane made its emergency landing at Takamastu Airport on January 16th, wingtip lights and a light at the tail were illuminated even though the cockpit switch controlling these lights was in the off position. 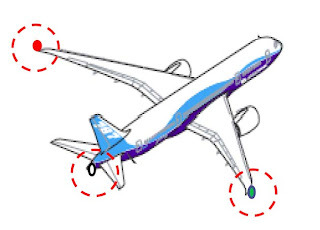 Illustrating the issue, the JTSB report provides the diagram of the airplane above. The investigators believe this indicates an unintended flow of power on the circuit. Now, I'm leaving the subject of the JTSB investigation here for the moment and with full disclosure, wandering into speculation territory. With some frequency I discuss battery design - a subject about which I know nothing - with someone who does, Don Sadoway, a professor of materials chemistry at Massachusetts Institute of Technology. One thing that the good professor keeps wondering about is the location of the circuit boards inside the battery compartment. Professor Sadoway's point, and I just throw it out here because it seems logical to me, is that it is an error to place the circuit boards inside the battery housing for precisely the reason made abundantly clear in the photo above. When the battery goes, so does the battery management system. "The electronics that are needed to intervene," are in the same box, he observes. "If the box goes into thermal runaway and the temperature gets high enough it will impair the ability of the battery management system to function." 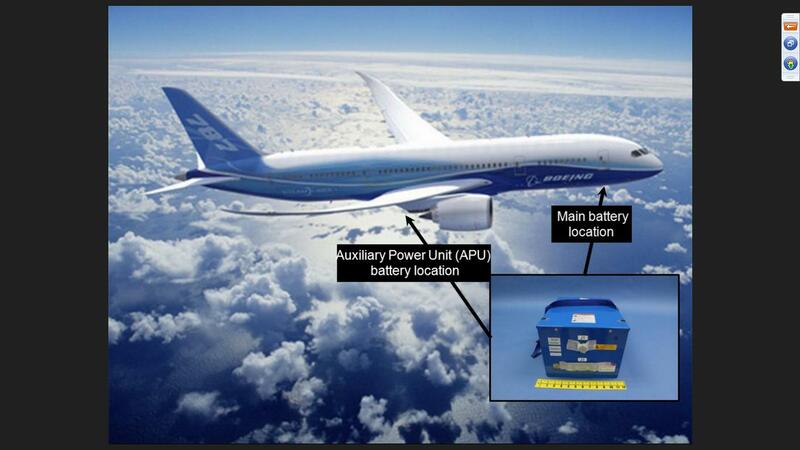 In today's New York Times, Christopher Drew reports that Boeing is headed to Washington DC and the office of the Federal Aviation Administration with its latest plan for how it will make Dreamliner batteries less scary. Drew's story also suggests all the other delays in the Dreamliner development is the reason Boeing stuck with its pre-2007 choice to use cobalt oxide, the most volatile type of lithium ion battery even after the very same formulation was the source of millions of laptop, cell phone and other device fires and the subject of the largest industrial recall in history. Read my story on this subject here. If Drew's story is correct, Professor Sadoway's earlier assessments of Boeing's battery design lapses seem to have been on the mark. "A heat trap," he said of the battery when I spoke to him three weeks ago. 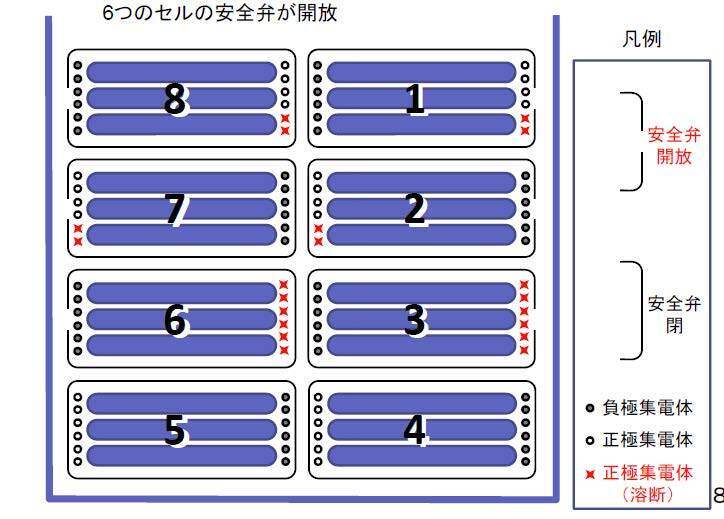 "In each module, you see six stacks. There’s no breathers at all they’re jammed right in there." Separating the cells, giving each more room to breathe is part of the plan outlined in Drew's story. Returning to the official experts in the investigation, the JTSB investigators warn that the findings of linked batteries in the ANA Dreamliner may have nothing to do with the fire that forced the airliner to make its unscheduled landing at Takamatsu and that investigation and the one here in the US, continue. Many questions remain only one of which is this: Given all the design issues that have come up in the past six weeks, how can Boeing possibly be ready now to tell the FAA it has all the answers? Nice pic of an ANA 767 up there! Other than that, interesting post, thanks. Quite right on the 767, but fixed now. Thanks for calling it out.